Our Hotel is one of the most iconic and charismatic properties on the old East side of Whitby. 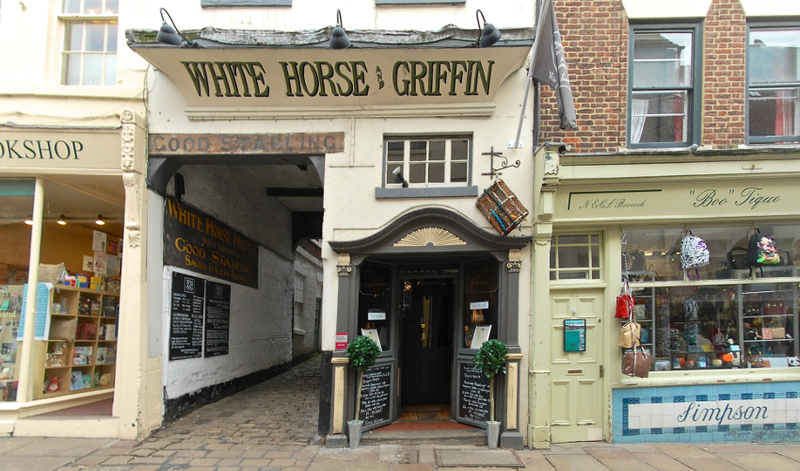 Built in 1681 by Sir Hugh Cholmley, the White Horse & Griffin was the first Coaching Inn from Whitby to York and London. It was operated as an Inn until 1939. It was also used as a meeting place for explorers Captain James Cook and William Scoresby who hired and fixed their crews from the building. The White Horse & Griffin closed in 1939 on the day of the Battle of the River Plate (the first major Naval Battle of the Second Wold War). Having fallen into dereliction in post War years, when it was predominantly used as storage for local fisherman’s nets and pots, the building was acquired and extended by local builder Stewart Perkins in 1982.The sympathetic restoration process he put in place took 11 years to complete and has created a remarkably authentic period atmosphere and ambience throughout the extensive accommodation. Since opening in its current guise in 1993, and built around an outstanding restaurant the White Horse & Griffin has developed into a famous success story. From the restored central entrance porch with its original decorative panels and the exposed Victorian signage through the cobbled alleyway, the Hotel has separate entrances via stone and rail steps and opens up to four floors within which are 10 en-suite double bedrooms. Each of the rooms and the first floor private dining room are designated by name from well-known Whitby ships and Skippers. The exposed timbers and stripped original panelling, restored cast fireplaces, decorative carpentry and plasterwork, together with quirky rooms and passageways breaths a history, which you can almost taste. Diners and guests who have visited the White Horse and Griffin over the years include acting legend Michael Caine, musician Bryan Ferry, the Queen’s cousin Viscount Linley and American Actress Linda Gray, best known for her role as Sue Ellen Ewing on the television soap opera Dallas. Celebrity chefs including Gary Rhodes OBE, the Two Fat Ladies, Brian Turner CBE and more recently Ainsley Harriott have all visited in the White Horse & Griffin’s kitchen. For nearly 20 years the reputation created by the dedicated endeavours of the Perkins family has improved hand-in-hand with the emergence of Whitby as one of the country’s most improved and highly regarded Coastal Heritage towns. Recently voted into the Top 3 Most Fashionable and Desirable Holiday Locations in England, this has been largely due to the considerable private investment which poured into the town in the post-90’s boom, catapulted forward again following the arrival from Australia of the HM Bark Endeavour, replica of Captain Cook’s ship HMS Endeavour. Whitby is renowned for its maritime importance, its place in fishing and seafaring history and its well documented religious and folklore connections, so the needs of a broad range of visitors have been successfully met by the White Horse & Griffin which plays host to a sophisticated captive market 52 weeks a year.